University of Chicago Press, 9780226356068, 408pp. Some books start at point A, take you by the hand, and carefully walk you to point B, and on and on. This is not one of those books. This book is about mood, and how it works in and with us as complicated, imperfectly self-knowing beings existing in a world that impinges and infringes on us, but also regularly suffuses us with beauty and joy and wonder. You don’t write that book as a linear progression—you write it as a living, breathing, richly associative, and, crucially, active, investigation. Or at least you do if you’re as smart and inventive as Mary Cappello. Mary Cappello is the author of five books of literary nonfiction, including Awkward: A Detour (a Los Angeles Times best-seller); Swallow, based on the Chevalier Jackson Foreign Body Collection in Philadelphia’s Mütter Museum; and, most recently, Life Breaks In: A Mood Almanack. Her work has been featured in the New York Times, Salon, the Huffington Post, on NPR, in guest author blogs for Powells Books, and on six separate occasions as Notable Essay of the Year in Best American Essays. A Guggenheim and Berlin Prize Fellow, a recipient of The Bechtel Prize for Educating the Imagination, and the Dorothea Lange-Paul Taylor Prize, Cappello is a former Fulbright Lecturer at the Gorky Literary Institute (Moscow), and currently Professor of English and creative writing at the University of Rhode Island. Visit her at her website: www.marycappello.com. "In these captivating essays, which meld memoir, philosophical meditations, and reports from excursions far, deeply interior, and wide, Cappello explores the abstract, amorphous notion of mood. . . . Cappello's fresh inquisitiveness and surprising trains of thought may well remind readers of the ruminative writings of Adam Phillips or Alain de Botton. An illuminating celebration of enveloping moments of being." "A book to set your imagination ablaze. . . . Cappello's writing is lyrical and poignant; she makes you shiver. . . . That’s not to say, though, that the only mood here is melancholy; even though she has trouble trusting genuine happiness, Cappello grows to embrace it. Like she might say, 'This is art that gets under your skin.'" "Cappello . . . has made a habit of calling our attention to states of being that are too often unremarked. . . . Formally, Life Breaks In is full of play; it is, as the subtitle suggests, an almanac of erudite and autobiographically playful dances around the possibility of what mood might be. . . . Cappello is both amusing and self-effacing, despite the high-wire choreography of combining source material and speculation, lyrical riffs and serious scholarship. . . . Life Breaks In is a book of many moods, certainly. It is also a tour de grace of scholarship, formal invention, and the discovery of hidden corners of emotional articulation: cloud rooms." “Cappello's new collection of essays is a 300-page thought experiment on mood, but calling it a collection doesn’t do justice to the scope of Cappello’s project. These essays don’t merely play off one another. They are distinct, stand-alone attempts at describing the often ineffable nature and origin of mood, part and parcel of one another—--much the way that moods themselves are distinct and unique, but collectively make up the reality of who we are. . . . Near the beginning of Life Breaks In, Cappello claims, 'in order to write or make art one must be in love, not with an individual per se, but with life itself.' And it may be Cappello's passion that comes through most clearly in this book--a passion wide enough and deep enough to encompass life and all its many moods." "I'm tempted to begin by comparing Mary Cappello to other contemporary literary nonfiction writers who meld memory and lyric impression with intellectual passion. Writers who come to mind--Rebecca Solnit, Maggie Nelson, Wayne Koestenbaum, bell hooks--certainly share borderlines and affinities, but none of their works really resemble the books that come of Cappello's singular voice and lens. Cappello’s compositions are at once sonic memoir, embodied criticism, and narrative cultural observation, drawing the attentive reader into what we might call the queer corporeal idea. . . . Cappello's new book, Life Breaks In, is at once rhapsodic, sensate, and intellectually captivating. . . . Reading Life Breaks In is, indeed, a kind of listening. It is time spent in a language-made listening room, a stroll into shifting human emotive time, a resounding of memory, imagination, story, and thought." "I loved this book. To wonder about the nature of the mood rooms people wander in, to attempt at access, and to see if they are anything like our own, is a fascinating study. Cappello has opened the backdoor to uncharted territory, a subdued though inescapable realm, that ranging spectrum of mood that each of us undergoes every day. In our world 'parsed by territories, psychic and bodily, political and aesthetic, imaginary and real, circumscribed and vast,' these invisible (psycho-emotional) containers we choose to live in are precious, volatile things. Wooden boats in a sea fraught with storms. And to better navigate the world’s moody waters, you would do well to explore the passage of Cappello's Life Breaks In, for it might just give you the insight you need to find shore, if but for a moment." "The book's real gift is how it talks about mood and the urgency of the creative task. The challenge to capture the ever-shifting world of mood when the physical world is always encroaching is worthy because the result is art, which has the ability to evoke a certain particular mood in others. . . . I admired that Life Breaks In didn’t mind having more questions than answers, and that it allowed me to sit inside that space for a while before my life broke back in." "Life Breaks In celebrates the intangible, investigating the place where interiority and exteriority meet, the mental space where the past ebbs into the present, weaving sense memory, cultural history, and personal recollection by connecting private and public moments in the experience of everyday reality. If tone is everything, this ambitious, humorous, yet serious creative-nonfiction study of mood is a necessary book for our time. . . . Creating an alternative to the impoverished mandate of our daily lives, the aesthetic challenge of Life Breaks In is not to explain or define mood but to notice it without killing it in the process." "Cappello's cirrus-wisps of thought may offer a means of glimpsing that elusive entity, [the soul,] allowing it to liveprecisely because they fail to entirely capture it: the inexpressible contained, as Wittgenstein wrote, inexpressibly in the expressed." "Are we sometimes not astonished by the beautiful futility of encountering some sudden fugitive moment that renders us so vulnerable to 'unanticipated forms': of perhaps an inner light or an inner dark? Here, with Mary Cappello's ravishing prose, lies a vibrating scalpel that intricately parts the belly of little swirling vertigos that we have no name for but know so deeply." "Life Breaks In encourages the reader to look, feel, and think more deeply, to linger and look again. Cappello's book is unpredictable. There's no sense of having read this before, or of being lulled by the reinforcement of long-held beliefs; this is--as its title would suggest--a disruptive work. Cappello's voice and approach are original and--again--in no way oriented toward 'cure.' This is indeed a book for the adventurous reader. Cappello's warmth and wry humor make the challenge approachable and inspire confidence that the payoff will more than equal the effort. At heart, Life Breaks In is not solely about mood. Cappello's book is, most deeply, a meditation on what it is to be alive in the world." "Life Breaks In makes me think of the workings of big minds like Anne Carson's, Carole Maso's, or Susan Howe's (e.g. My Emily Dickinson), all relentlessly curious and similarly fearless, all four writers irrepressible masters at their craft, creating full-immersion experiences for any reader willing to go on the journey. The pleasures for me were both aesthetic, in how original and fine the writing, and esoteric, in how much I learned. Mary Cappello is a brilliant and exuberant original." "Mary Cappello's imagination is an idea accelerator dedicated to the continual astonishment called our world. It exhibits a fierce curiosity about everything, a will to cheer before the surprising juxtaposition, the sudden linkage, the creation of genre fusion that includes (but is hardly limited to) meticulously researched and wide-ranging cultural history, theory, esoterica, song lyrics, and personal recollections. The result is splendidly associative, revealing, humorous, poignant, eccentric, nuanced, and nothing if not beautifully self-aware. 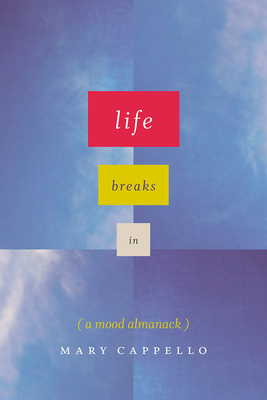 In Life Breaks In: A Mood Almanack, Cappello informs us 'Kenneth Goldsmith calls Facebook status lines "mood blasts."' Every paragraph of Life Breaks In is a Think Blast, and great pleasure to follow into its marvels." "Trained as a poet, writing in the in-between state genre known as literary nonfiction, Mary Cappello has called the essay, after Gertrude Stein, 'a kind of writing that doesn't aim.' Mary's essays tune us in to a vibrational register, to the timbre or power to touch us shared alike by things, words, places, persons, and narratives. Cappello's language grazes the circumstances of ongoing life: it echoes and echo-locates in the midst of surroundings. Just like mood, but a mood that (following Montaigne) puts our thought 'in apprenticeship and on trial,'these essays refuse to be contained." "Learned, rigorous, and at times intimate and devastating."